Click on the bars below to all the subdivisions and condo & townhome complexes in Henderson. You can also view the most popular searches such as ranch style homes, new construction, homes with a pool or houses with mountain views. Click to see Local Subdivision and Complex Maps. What is Your Henderson Home Worth? Henderson is a small community located in the North Metro region, just 14 miles from downtown Denver. Thanks to its ideal location, Henderson, CO has become a very popular commuter community, with several major subdivisions arising over recent decades. Indeed, Henderson itself is merely a post office community, but has been transformed with homeowners flocking to the area to experience access to big-city amenities set amidst beautifully designed subdivisions in Colorado’s natural beauty. Overall, Henderson has become a desirable and affordable place to live, with many homes available for under $500k. River Run is among the most notable subdivisions in Henderson and also the largest, boasting over 1000 affordable homes that have become popular for families. Highlighting the ongoing appeal of Henderson, CO, there are several new subdivisions open with ongoing development, such as Belle Creek and Stillwater. As a popular commuter town, Henderson has several complexes, specifically at Lakes at Dunes Condos and Villas at River Oaks Condos. 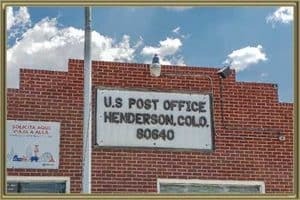 Henderson, Colorado, is a family-oriented community with a robust education network. Students will attend schools in the District 27J Brighton school district. The schools are Thimmig Elementary, Prairie View Middle, and Prairie View High. As a small commuter town, Henderson is surrounded by both big-city amenities and natural beauty. Numerous small lakes are dotted around the community, adding an elegant beauty to the subdivisions in Henderson. Close by sits Barr Lake State Park, a vast open space including water activities, trails, forestry, and greens. Henderson is also well-connected golf town that hosts two fantastic golf courses at the extensive Riverdale Golf Course, Buffalo Golf Course, and Todd Creek Golf Course. Sitting so close to Denver gives residents in Henderson access to all the restaurants, retail locations, nightlife, and transport links associated with the urbanite lifestyle. However, there is also plenty to do in the Henderson region, such as the Prairie Center Shopping Center. See all the Things to do in Henderson, CO.
With so much to offer, there’s a good reason why homeowners have been flocking to Henderson for many years. Gold Compass Real Estate is a leading name in buying and selling property in Henderson, and the wider Denver region. We work with our clients to find the best possible home to suit their needs and budget. The real estate market in and around Henderson is among the most vibrant in Colorado, so if you are looking to sell a home, Gold Compass can help. Mike Lies and the team are fully trained agents with expert knowledge on the market in Henderson, Colorado, including pricing trends for specific subdivisions. Getting started selling in Henderson is easy, so check out your free Home Value Instantly Online now. Our mission is to give homeowners coming to Henderson the best opportunity to find the home of their dreams. With that in mind, we ensure our online listings are always fully up-to-date, reflecting any changes in properties. A great way to get to know the real estate market in Henderson is to download this complementary Free Personalized Market Report. For more information on moving to Henderson, CO, contact us at 305-325-5690.